The COR is the organic certification system that regulates the distribution and marketing of organic products in Canada. Previously created under the Organic Products Regulations, the regime is currently outlined in the Safe Food for Canadians Regulations, which regulates all parties that play a role in the certification of organic products. The regulations apply to any organic product that crosses provincial or national borders or bears the Canada Organic Logo. Because only products that cross borders are covered by the COR, provinces may create their own regulations for intra-provincial trade. In this case, enforcement may be a shared jurisdiction between the province and the CFIA. The CFIA is the authority that oversees the organic sector. It is responsible for verifying and enforcing the regulations set out in federal policy. This includes the designation and accreditation of two enforcement bodies: Conformity Verification Bodies and Certifying Bodies, whose roles are outlined in the COR operating manual. Additionally, along with the Canadian Organic Trade Association, it establishes organic equivalency agreements with other countries so that Canadian organics can be traded and regulated across federal borders, encouraging trade and growing the organic sector. Canada currently has agreements with the European Union, United States, Japan, Switzerland, and Costa Rica. CVBs assess applications from certifying bodies and make recommendations to the CFIA about which ones should be accredited. There are three CVBs designated by the CFIA. CBs ensure that organic producers, processors, and other operators adhere to Canadian Organic Standards (COS). They issue certificates for organic products and companies and ensure that labelling and packaging meet the Standards. They are accredited by the CFIA to issue organic certification. There are seven active certifying bodies in Ontario and many more around the world. Anyone who produces organic products must comply with the COS, as well as other Canadian legislation that applies to food production. Those looking to be certified must apply to a CB. This can cost anywhere between $300 and $2,000, depending on farm size and certifying body. The COS are a set of industry rules that outline the principles of organic production, and are formally referenced in federal regulations. The COS are comprised of the principles and standards document, as well as a permitted substances list. Though they are owned by the Canadian General Standards Board (CGSB), the federal government organization that oversees national standards and their review processes, they are written in collaboration with organic industry stakeholders and renewed every five years. The SIC is an advisory body created by the CFIA and its industry counterpart, the Organic Federation of Canada (OFC). 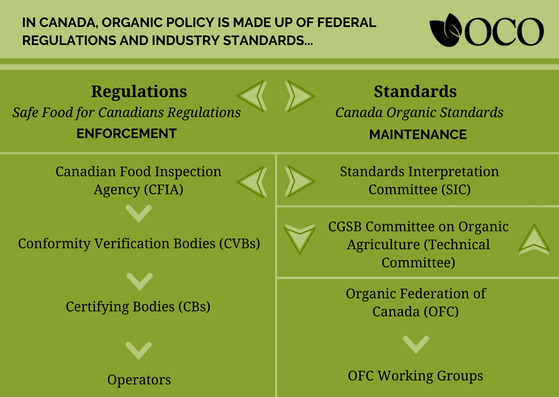 Made up of appointed members from across the organic sector, it helps interpret the COS by providing guidance to the CFIA in its enforcement of the Standards, and provides input to CVBs and CBs as well through the OFC website. The SIC also receives feedback from operators, CVBs and CBs through question and comment processes. The COS must be reviewed by the industry every five years, a process overseen by the CGSB’s Standards Committee on Organic Agriculture, also called the Technical Committee. It is made up of industry experts representing various interests within the organic sector, including producers, consumers, regulatory groups, and more. The OFC is an organization working on behalf of the Canadian organic industry. Its members are the provincial organic organizations from each province. It coordinates the Standards review every five years. The OFC accepts proposals for modifications to the Standards from industry stakeholders and forms working groups that make recommendations to the CGSB Technical Committee. They also oversee the organic science research cluster funding in coordination with the Organic Agriculture Centre of Canada. During the of standards review, working groups function as links between organic sector members and the CGSB. Working groups are organized by the OFC, which gathers petitions for modifications in order to set the scope of each working group. The working groups then debate the issues brought forth in the petitions, and make recommendations to the CGSB’s Technical Committee.